You won’t believe how easy it is to make fun and festive Shamrock Pancakes for St. Patrick’s Day breakfast! These are a HUGE hit in our house! Being a quarter Irish, St. Patrick’s Day was always celebrated in our house growing up. It’s a tradition I still love to pass on to my kids. Call me corny, but I love the green-colored food and shamrock-shaped everything! And of course we wear green all day too! 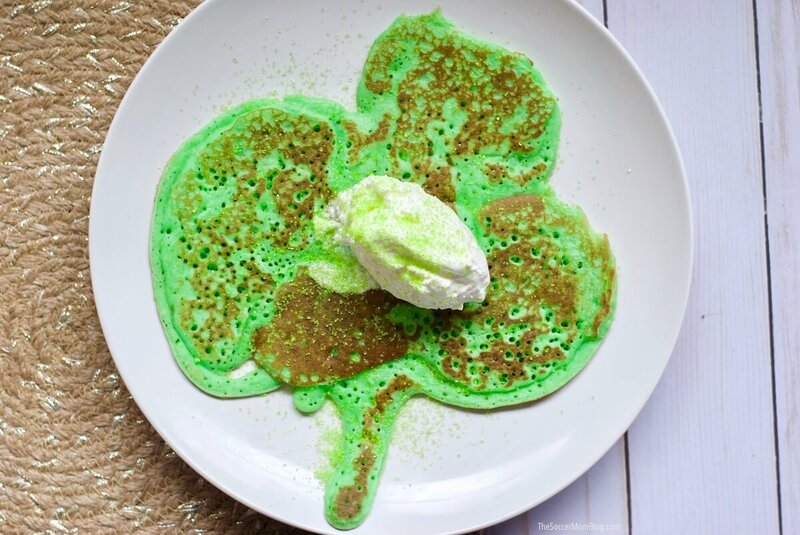 These Shamrock Pancakes are surprisingly easy to make (especially if you start with boxed pancake mix!) We tested them out today (a month early, I know) to see if my squeeze bottle idea worked. It did and these vibrant green pancakes were a huge hit with the girls! 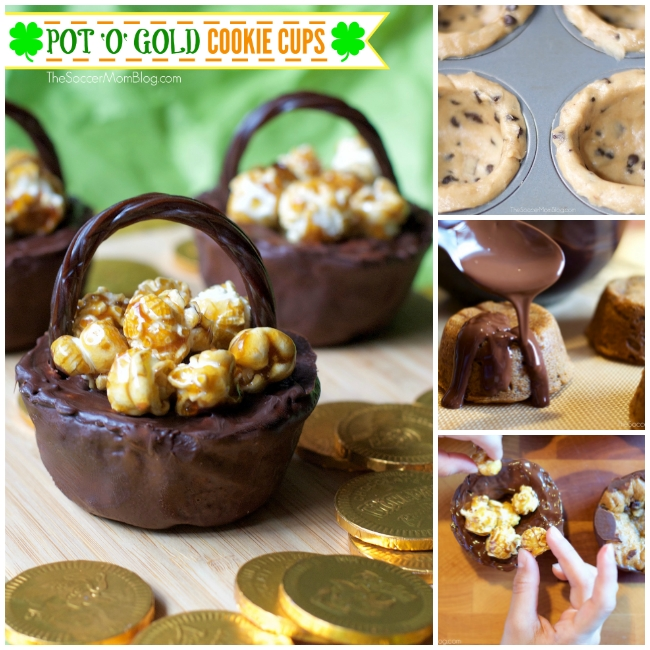 We’ll definitely be making these again on the actual morning of St. Patrick’s Day! 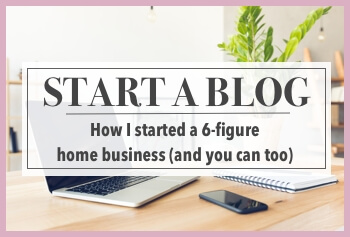 For your convenience, I’ve provided shop-able ad links to products used to make this recipe; read our disclosure policy here. 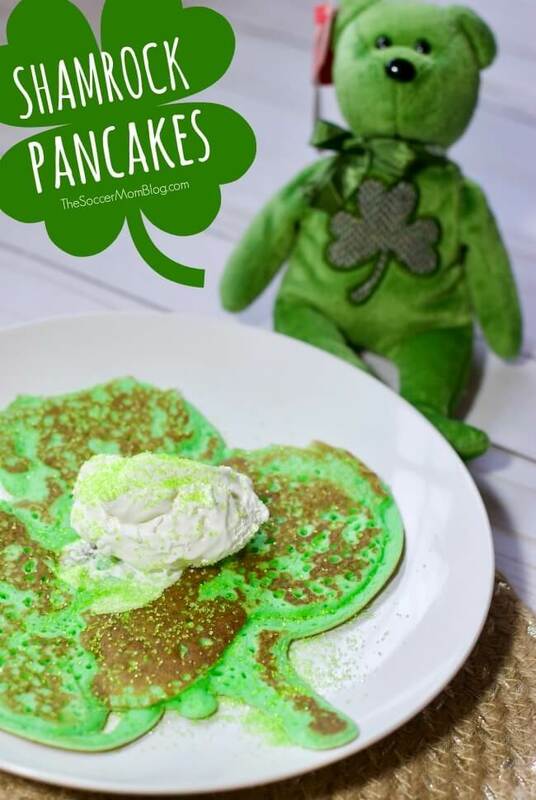 Free printable copy of this shamrock pancakes recipe, as well as a recipe video are available at bottom of post. 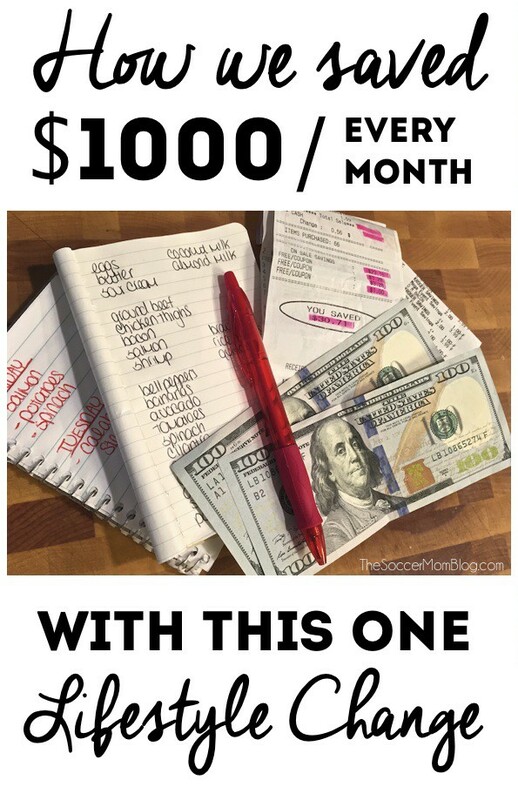 Keep reading for photo step-by-step instructions or click here to jump to printable recipe and video. To save time, we used boxed pancake mix. Using a box mix also makes it pretty much foolproof to cook perfect fluffy pancakes! 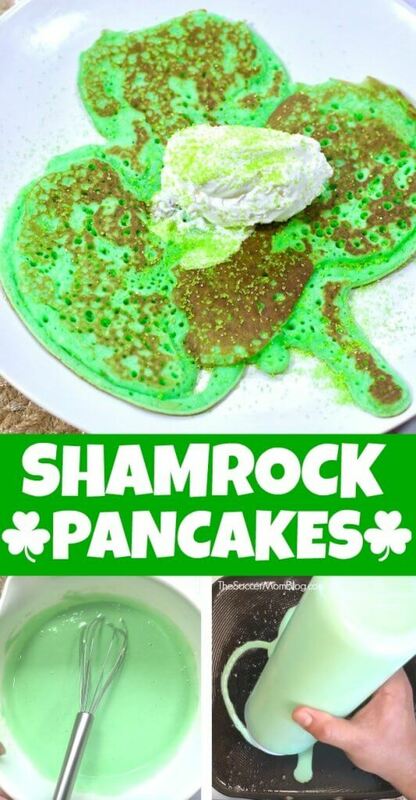 Make them gluten free: To make our shamrock pancakes gluten free, simply use a gluten free pancake mix (we love this one) or our homemade gluten free pancake recipe. 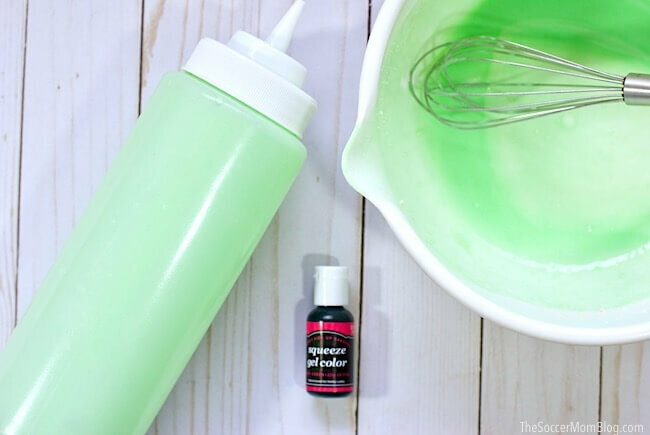 Once your batter is mixed, stir in 2-3 drops of bright green gel food coloring — a little bit goes a long way! 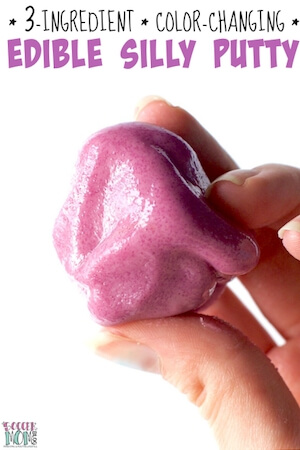 Pour batter into a plastic squeeze bottle. We keep a few of these bottles on hand for baking projects, serving sauces, etc. They’re super useful! Tip: In a pinch, you could use an old ketchup or syrup bottle (thoroughly cleaned first) to pour your pancakes. Warm up a flat griddle over medium heat. The temperature should be just right when a drop of water sizzles on the griddle. When griddle is ready, coat generously with butter or cooking spray so pancakes won’t stick. 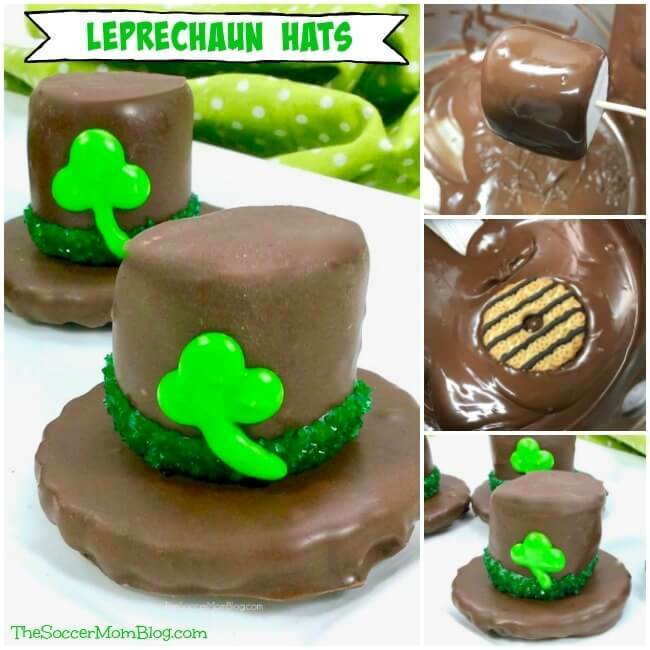 Use the squeeze bottle to draw the outline of a shamrock with batter, connecting the ends completely. After you’ve drawn the entire outline, fill in the middle with batter. Tip: Work quickly so that your pancakes cook evenly! Your pancake is ready to flip with the top surface is covered with tiny bubbles. For easier flipping, we used a large fish spatula. 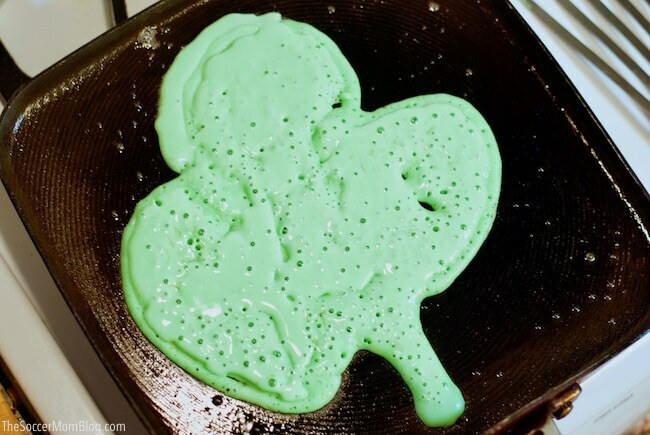 This allowed us to create large shamrock pancakes that practically fill up an entire plate. Cook another 1-2 minutes after flipping, then slide pancake off griddle onto a plate. Top with whipped cream and green sugar sprinkles for extra fun! 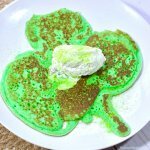 You won't believe how easy it is to make fun and festive Shamrock Pancakes for St. Patrick's Day breakfast! 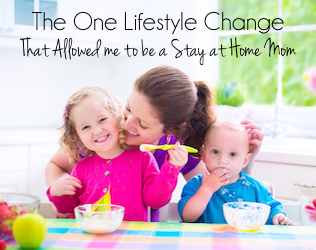 These are a HUGE hit in our house! 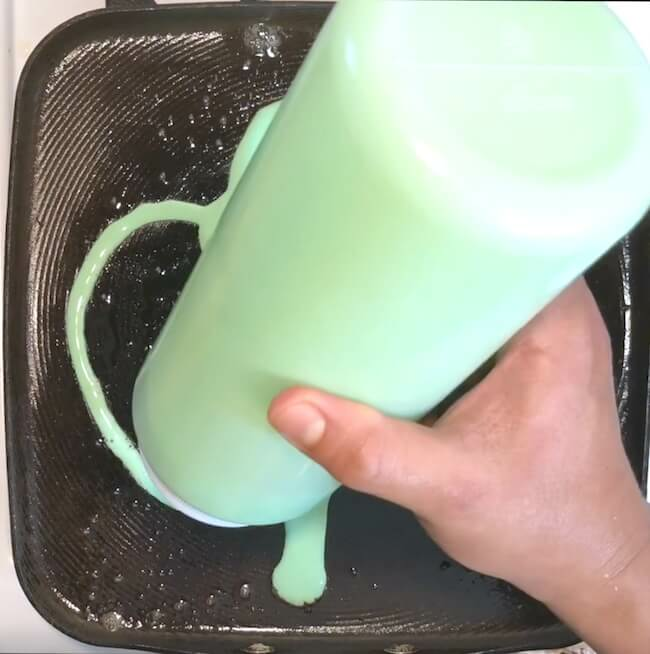 Pour batter into a plastic squeeze bottle. We keep a few of these bottles on hand for baking projects, serving sauces, etc. They're super useful! When griddle is ready, coat generously with butter or cooking spray so pancakes won't stick. Note: Nutrition information based on 1/2 cup batter, prepared, and is a rough estimate only. 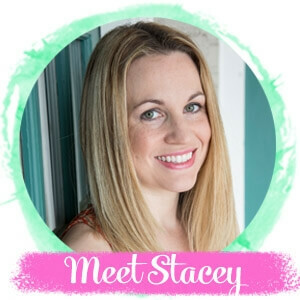 Actual values will vary based on the exact ingredients used and amount of recipe prepared.